Which One to Get? Depends on What You Want to Do! Now that Jack3d Micro’s out, everyone’s been asking which one to take. Put simply, it depends on what you are trying to do. The most general breakdown is that Jack3d Micro is a great balance of both pumps and a bit of energy, while Jack3d original is definitely far stronger on the energy side. So if you’re looking for incredible weightlifting workouts, and are looking for a “new” stimulant that won’t have you over-caffeinated, Jack3d Micro is the way to go. 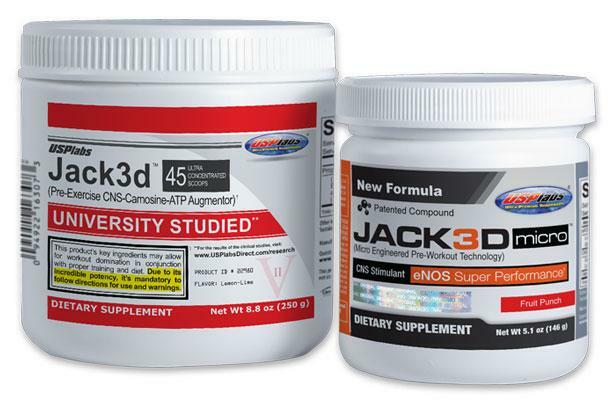 On the other hand, if you have a pretty high stimulant tolerance and want some excellent energy, or are doing cardio or endurance sports, the original Jack3d is a clear winner. The question is… do you really need the incredible pump ingredients in Jack3d Micro? If not, then stick with Jack3d. If you want a pump, Jack3d is the way to go. Another reason to try Jack3d Micro is if you live in a country that no longer sells Jack3d. This is the case in the UK, Australia, and New Zealand. That’s as basic as I can make it. For more info, read on! A few years back, USP Labs came out with a proven winner in their pre-workout supplement Jack3D. For many years since its introduction to the market, Jack3D has been, to many, the superior nitric oxide (NO) pre-workout booster until talks of banning the product came out sometime July of this year. For years, Jack3D has been the go to pre-workout supplement of many competitive athletes, body builders, and fitness enthusiasts. Jack3D was all the rage and has become instrumental to many gym goers because of how it improves their workout sessions in the most efficient possible way. For many years since its introduction to the market, Jack3D has been, to many, the superior nitric oxide (NO) pre-workout booster. Arginine alpha –kletoglutarate – A precursor to nitric oxide production which enhances blood flow and nutrient delivery . This is what gives Jack3D more incredible pumps. Creatine monohydrate powder – A staple in many pre-workout supplements. Creatine is a nitrogenous organic acid that supplies energy to all muscle cells in the human body. Beta Alanine – Essentially, beta alanine is an amino acid that has been proven to reduce fatigue and improve the body’s muscular work. Caffeine – One of the more popular stimulants available in the market, caffeine stimulates the release of energy and allows for better focus, drive, and motivation. Schizandrol A – Traditionally used in ancient Chinese medicine, Schizandrol A has been found to have anti-oxidant, anti-inflammatory, anti-amnesiac and neuroprotective properties. 1,3 Dimethylamylamine HCI – More commonly known as DMAA, is what makes Jack3D superiors to other pre-workout supplements. DMAA is naturally found in the geranium plant, and has been used for many things. Among others, when distributed in small prescribed dosages, DMAA is a powerful stimulant that allows for improved energy levels and better focus. Whether or not Jack3D will be officially banned is still unclear. However because of its sheer popularity among the many people who can attest to both its efficacy and safety, it is certain that banning this product will stir up a more than a little tension in the body building community. Essentially, a reinvention of the original Jack3D formula, Jack3D Micro is loaded with a different set of ingredients that delivers an entirely new user experience, helping you conquer your workouts like never before. Officially made available in the market last Aug 13, 2012, Jack3D Micro serves as an alternative, NOT a replacement, to the original Jack3D. Promoting superior pumps, laser-sharp focus and motivation, and improved endurance; Jack3D Micro is best described as a pre-workout supplement perfectly cut out for adaptive training. A SUBSTITUTE, not a Replacement! Arginine nitrate – works as the secondary pump ingredient of Jack3D Micro. Arginine nitrate boosts the nitric oxide production of the body further and magnifies the already incredible pumps that synergistically created by the other pump ingredients. Agmatine sulfate – also a pump ingredient of Jack3D Micro, Agmatine sulfate is naturally a decarboxylation product of the amino acid arginine which is best known for boosting the body’s nitric oxide production. Agmatine sulfate promotes enhanced nutrient transport, better nutrient partitioning and a healthier blood flow. Caffeic acid (3,4-Dihydroxycinnamic Acid) – makes up for the antioxidant component of Jack3D Micro. Apart from having anti-cancer qualities, Caffeic acid has been found to possess anti-fatigue and anti-inflammatory properties that help greatly in post-workout recovery. Together with Arginine nitrate, this is among the main reasons why Jack3D users can’t stop conquering their workouts. Norcoclaurine HCl / Higenamine – is Jack3D Micro’s thermogenic stimulant. Naturally occurring in the Nandina plant, Higenamine has been reported to improve the rate at which the body burns fat. Caffeine – the only common ingredient between the original and reinvented Jack3D, caffeine improves the body’s energy levels, and enhances cognitive functions, allowing for better focus, drive, and motivation. Vitamin C – one of the safer, more efficient, and more popular nutritional supplement, Vitamin C promotes overall health in Jack3D Micro. Physiological benefits of vitamin C include, among others, a more active immune system, enhance cardiovascular system, and better skin and eyesight. Additionally, Vitamin C is also an anti-oxidant that acts against free radical damage. Recent studies show that Vitamin C is also instrumental in protecting the body again cancer and strokes. Apart from the apparent difference in formulation that promises unique user experience for both products, here is a more general breakdown of the main difference between Jack3D and Jack3D Micro. Because DMAA is a more powerful stimulant, and because it is likely using more caffeine, the original Jack3D packs much more energy than Jack3D Micro, making it the ideal supplement for workouts that focus on the endurance and cardio. 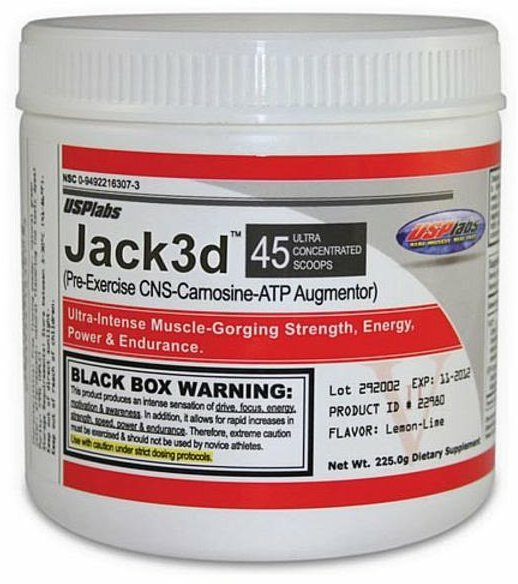 Because of Jack3d Micro’s arginine nitrate which magnifies and lengthens the effects of other pump ingredients such as L-citrulline and Agmatine sulfate, Jack3D Micro packs more pumps, making it the better supplement for activities that need quick bursts of energy such as heavy weightlifting and sprinting. Additionally, Jack3d has more flavors, for those who care. For those who are annoyed by tingles, Jack3D Micro is the better option since it does not have Beta Alanine. Also, especially for those who raves for creatine in their system, note that while the original Jack3D does have creatine, Jack3D Micro does not.